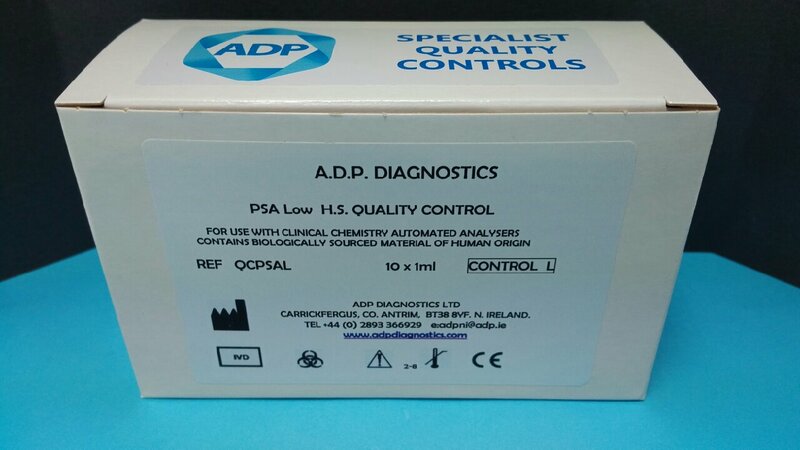 ADP Diagnostics are proud to announce our world first Serum Indices Quality Controls. Now available for Abbott, Beckman, Roche, Siemens. 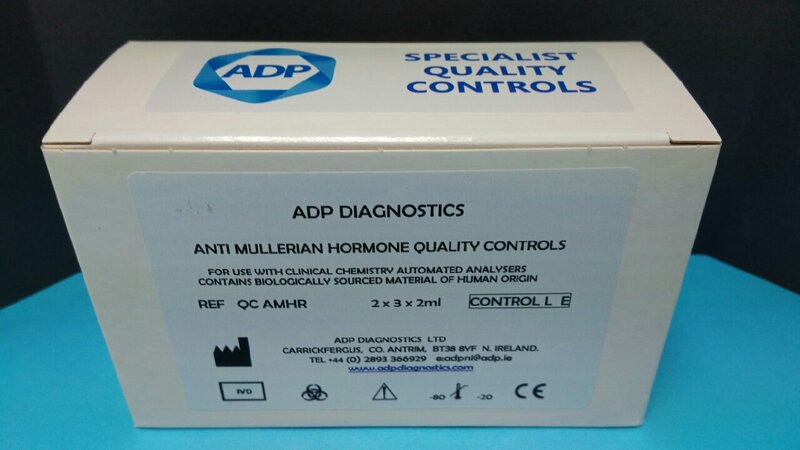 This is a unique product to ADP Diagnostics. No other manufacturer worldwide offers a similar specification control. Xanthochromia Quality Controls. The only product with this specification available worldwide. Available Now, Whole Blood, Liquid Stable, HbA1C Quality Controls, 18 month expiry. A WORLD FIRST, now available for Roche and Abbott clinical Platforms. QCAMHR. This is our first kit format for independent control of your AMH assay, whether for the Roche Cobas, Beckman Access automated System, or an Elisa Format. Developed in conjunction with the Royal Victoria Hospital in Belfast, N. Ireland. 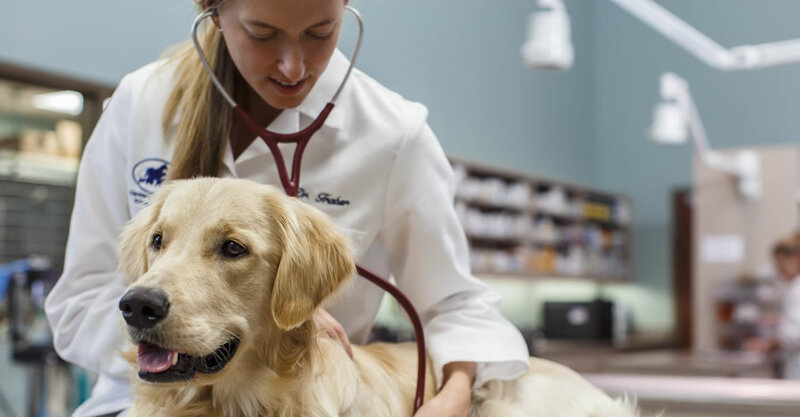 The levels have been chosen to reflect critical clinical cut-off values around 12 pmol/L, a mid assay and an elevated level of 90 pmol/L, to check the linearity of the assay. "A low level or undetectable PSA level is defined as less than or equal to 0.06ng/ml or 0.02ng/ml by the American Society for Theraputic and Oncology consensus Panel. As defined by the Institution, it is agreed that a 6 to 12 months 'undectable PSA' is a prediction of disease free survival 'DFS'. Therefore an ultrasenstive assay is beneficial." With a target value of 0.06 ng/ml (Roche Cobas), our kit reflects the guidelines. Stored @ 2-8 C, open vial stability is 14 days. The kit size is 10 x 1ml. 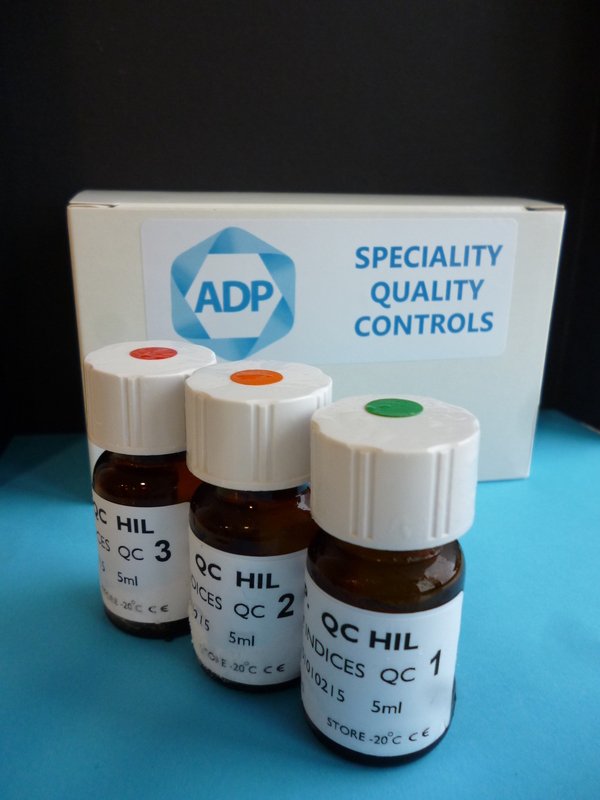 In a first for ADP Diagnostics, we have secured a contract to supply the Slovenian National EQA Scheme, SNEQAS with 3 materials for different schemes. 2 of these products were custom manfactured to the Scheme's specifcations, both in terms of analyte values, and fill volumes. If you require a speciality or custom manufactured control for your EQA scheme, please contact us.